This gentleman, who preferred that I not use his name, said that he picked it up in an antique shop in Frederick, MD about ten years ago and that it is in a marked Charles Rholfs frame which is dated 1903. He further added that Rholfs was one of the leading arts and crafts furniture makers and from Buffalo, NY. If you would like to see some of Carl’s paintings, visit this website. I am a relative of Eleanor Douglas. My grandmother was Helen (Douglass) Richardson, the youngest sister of Silas Douglass. As I grew up, Grandma had two paintings of Eleanor Douglas’s in her livingroom, and my mother also had one of her paintings. 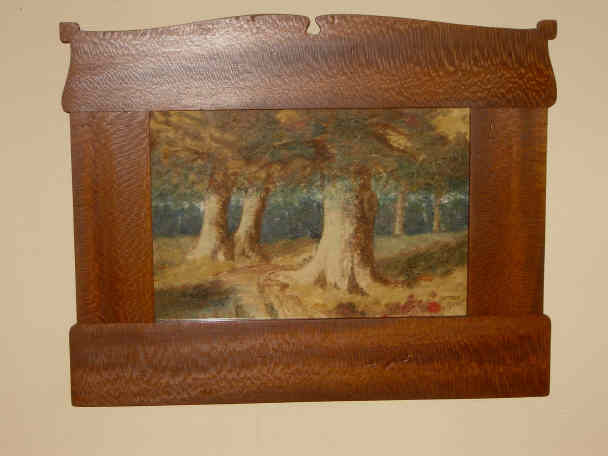 I don’t know what happened to my grandmother’s paintings after her death in 1996 because my uncle, her son, and I had had a falling out and have not reconnected. My mother’s painting, however, is now in my possession. From what I remember of those other two Douglases and from what I’ve found on the internet about her, this painting is quite moody and dark, but it is signed in the lower left-hand corner. While I am an art enthusiast–probably the only one in my family at present–I am far from being a connoisseur. I need to find out how to insure the painting and at what cost. How do I go about doing that? I now live in Nanaimo, British Columbia, Canada. Please advise. I must apologize for my delay in responding to your comment on my website. From August through October I was on the road for weeks at a time and I only recently got back to my genealogy. In fact I just found your comment this morning. What you do have is good provenance, in other words, you know personally where it came from as it was in your family. Sometimes that is important in establishing art value. That is about the extent of my knowledge on the subject. So good to hear from you and to know I have a relative in Nanaimo. I have a son in Seattle, so perhaps we can meet some day. Thank you for your message. I wasn’t bothered at all by the wait. I am, however, glad that you made it home safely from your travels. I did talk to an art dealer in Victoria, B. C.–one of considerable reputation, I found out after the fact–who said that, indeed, the painting isn’t even worth insuring separately from the rest of the household goods. 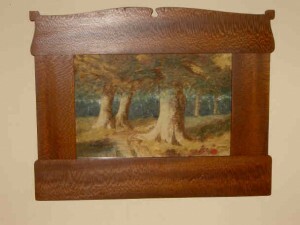 Without having seen the painting itself, he estimated the insurance value at no more than $500 Canadian for a large canvas, and this one is actually quite small. Alas. I am glad to have it, nonetheless. Few people in my family have the appreciation for art that I inherited from my grandmother, and I am quite fond of this one. It would be nice to see it get a home back in the Douglass family after my time on Earth, however. My daughter doesn’t share my enthusiasm for art in general, let alone this painting. So if we could keep in touch, I would very much appreciate it. It may be that she could deliver it to your children in years to come. That will, of course, be her decision, but I would rather get it back into the family than have it sold at auction.